A lot of people came to support the so-called "terrorists"
October 11, in Simferopol, on the Boulevard of Franko, the Kremlin-controlled police began to disperse activists who came to support the Crimean Tatars detained in the morning the same day and accused of involvement in the banned organization Hizb ut-Tahrir al-Islami. The organization "Crimean solidarity" provided information on the matter on Facebook. “We have just received a video showing how on the boulevard of Franko the police "on behalf" of the FSB took all possible measures to prevent the congestion of people near the Main Directorate of Security Service," the message said. The organization further noted that a lot of people came to support the so-called "terrorists". 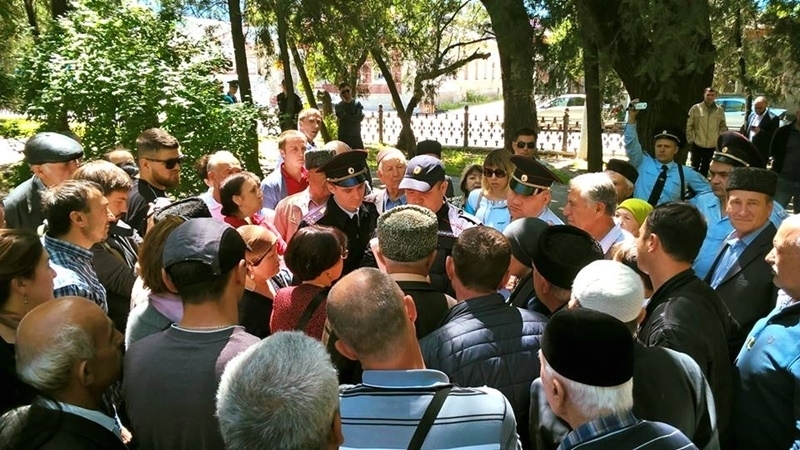 Earlier, the wives of Crimean Tatar activists detained in Bakhchysarai on October 11 reported details of the searches of their houses and the detention of their husbands by the security forces. Nine activists in Bakhchysarai who came to support compatriots during searches were detained under part 1 of Art. 20.2.2 of the Administrative Code of the Russian Federation and accused of "organizing a mass simultaneous staying and (or) movement of citizens in public places, which caused a violation of public order". Some activists were injured. In particular, the traces of beatings are observed on Ismail Asanov (an abrasion on the head, he was also hit on the ribs), Ernest Ibragimov (has scratches on his arm) and Rudem Nedzhiev (beaten, also have a scratch on his head). In the morning of October 11, searches were carried out in several homes of Crimean Tatar activists in Bakhchysarai. The Russian media immediately spread information that the activity of the organization banned in the Russian Federation, Hizb ut-Tahrir al-Islami, was allegedly suppressed in the annexed Crimea. Reportedly, FSB detained not only the owners of houses, but also the people who came to support them. According to eyewitnesses, the security officials acted with particular animosity. In particular, law enforcers did not allow lawyers to the sites of searches, a large number of representatives of various security agencies and dog specialists were present, communication and Internet were jammed, the whole city was blocked. Also, locals noticed a lot of car wagons not only in the places of searches, but even outside the city. Lawyer Emil Kurbedinov noted that such actions of the Russian Federation can serve as a reason for its exclusion from all international treaties on combating terrorism. FSB tags Crimean Tatars detained today as "terrorists"